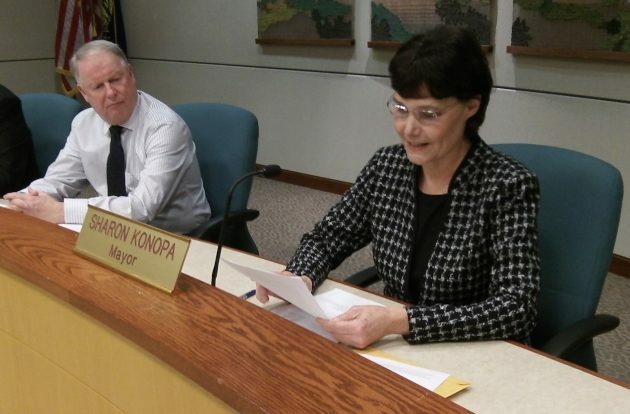 Mayor Sharon Konopa (in a 2015 file photo with City Manager Wes Hare) asked for action against predatory towing in December. What’s known as predatory towing would be finished in Albany under an ordinance requested by Mayor Sharon Konopa and coming up for city council review and possible action this week. Back in early December, Konopa told the council about a woman of modest means whose car was towed from her Albany apartment complex to Salem. To reclaim the vehicle cost about $500. The owner had a card entitling her to park in a spot for the disabled, but she had apparently forgotten to display it. The mayor asked the police what could be done. More recently, the Albany Democrat-Herald reported on that and a similar case. Signs similar to this are all over the place. In response to the mayor’s request, Chief Mario Lattanzio and Kris Schendel, code compliance officer, sent the council the draft of an ordinance. It’s on the council’s work session agenda Monday, and the council may act on it Wednesday. “Predatory towing is occurring within Albany and has been an issue for our residents and visitors as they are being fined excessive tow fees and (must) travel excessive distances to retrieve their vehicle,” the police said in a memo. As authorized by state law, they are proposing to add a chapter to the Albany Municipal Code to regulate private property towing, allow citizens to submit written complaints, and set up a procedure for staff to address those complaints. 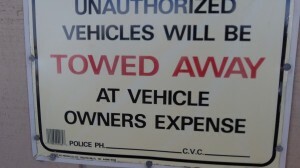 The proposed law would prohibit tow companies from patrolling private parking lots to look for potential tows. It would also ban them from parking within 1,000 fee of a private lot for “covert observation” in order to get tows. Posting a lookout for the same purpose would also be banned. In addition, the ordinance has safeguards against various kinds of towing practices, including hooking up a car and taking off even though the owner has arrived. If a tow operator is still attaching a parked vehicle but has not yet put his truck in gear and started moving, the vehicle would have to be released to the owner without charge. If the tower is already moving when the owner shows up, the tower must stop and give up the vehicle but can charge the basic hookup free as a “release at scene” fee. Significantly, the ordinance would ban taking towed vehicles outside the city limits unless authorized by the police, and then no farther away than three miles. No more having to get somebody to drive you to Salem to bail out your car. A separate council resolution would set hookup fees allowed in Albany, ranging from $165 to $300 depending on the circumstances. Mileage charges for the tow would be capped at $5 per mile. Additional fees also would be limited. Violations could be handled as civil matters with a top penalty of $1,000 or a misdemeanor crime, where the top penalty is $2,500 and a year in jail. I wonder why there is no clause to accuse the tow truck driver of vehicle theft. That is exactly what they are doing. The most disturbing angle on Hasso’s expose’ is that our elected leaders have taken until February, 2016 to get up off their sleepy derrières and actually do something to prevent honest citizens from being screwed by greedy tow businesses. You really have to wonder which business lobbying interests paid which politicians to allow such draconian towing statutes to exist in the first place. The mayor, along with the rest of the Council should not be congratulated for finally doing what they should have done long ago. Rather, they should be ashamed and embarrassed that it took a disabled woman who’s car was essentially stolen by a predatory tow company to get our so-called leaders (a Trumpism) to finally take action. Hopefully impound fees will also be regulated. Don’t give these predators any loopholes.